Skiing not your winter sport of choice? This cabin is a snowmobiling Cross-country ski Oasis. 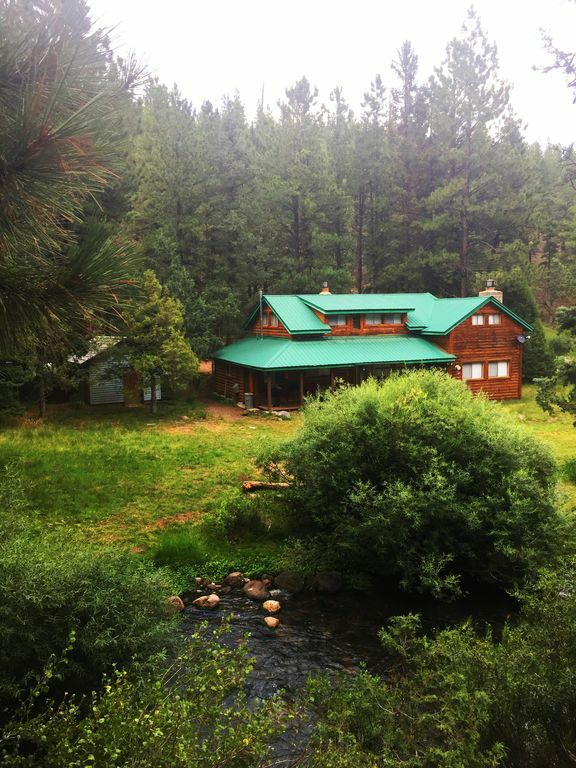 Enjoy the peace on Mammoth Creek, the sound of the creek in your backyard, 10 miles outside of Brian Head. This beautiful log cabin is a wonderful place for a peaceful vacation getaway. The mountain home is the ideal vacation rental for large gatherings or family reunions. Beautiful Mammoth Creek runs right through the back yard and has great trout fishing. Enjoy stream or lake fishing, mountain biking, hiking, ATV trails, or explore Mammoth Cave. The vacation rental cabin is within 20 minutes of Panguitch Lake, store, gas, and restaurants. Zion National Park, Bryce Canyon National Park, Cedar Breaks Monument, and the Utah Shakespearean Festival, Duck Creek, and Brian Head Resort all surround the area. Brian Head Ski Resort is a short 20 minute drive, yet you have the beauty and stillness of the winter mountains. The cabin has a large living/family room with fireplace. There is one bedroom with a queen bed and one double downstairs and one bathroom downstairs. There are two sets of stairs leading to upstairs bedrooms. Each bedroom has at least two beds. There are two kings,2 queens,5 doubles, and 4 twin beds. The other full bathroom is upstairs. Enjoy this great vacation rental cabin with your family and friends. WE DO NOT ALLOW GROUPS OF SINGLE ADULTS IN THEIR 20'S. NO HOUSE PARTIES OF ANY KIND. PLEASE NOTE: This cabin is NOT right in the town of Brian Head-it is 10 miles outside of the town. A 4 wheel drive vehicle is REQUIRED (w/ chains) during the winter months, Oct 15-May 15. A snow plow fee may be applied to the cleaning fee during winter months to cover snow plowing. Great place to snowmobile or cross-country ski in and out of in winter. Wood and Gas Fireplaces, High speed internet-DSL, 27' Satellite Tv, VCR-DVD in living rm, TV-VCR in master bedroom, New living room furniture, New flooring through first floor. Great base for zion, Bryce canyon, and escalante.